So a few months back Wantable announced that they would be Launching in Canada in April , but then it got pushed to May . They also announced that they would be giving the first 1000 people who had signed up a free box ( all we would have to do is pay the shipping and handling and the duties.) then they announced that the second 1000 would be getting a BOGO buy one month get the second free..not bad at all. The Wantable claims that when you subscribe and take the quiz that you are able to say if you love , like , or hate a type of item, colour, or texture...from that quiz it decides what items you will get in your box....so each box is worth between 80+-100$ depending on what you choose . So a few weeks ago I got my email that stated I was one of the lucky first 1000 people to sign up so I was getting my first box for free after shipping and duties . The box =36$ a month +9.79 for shipping and duties . I have yet to use these but I have seen really good reviews and one of the ladies in the beauty groups I am in LOOOOOVED them so I will give them a try soon!! My first impressions was not good but after I put it on I really loved the Colour , I found that it tasted like some of the MAC Lipglasses and it lasted a loooong time. I was super excited to get this in my box , I really wanted to try the Rainbow Honey nailpolish. I just wish I would have gotten the awesome pink that others got .. but I do love how glittery this polish is and I am sure it will be put to good use. I was sooo happy to get this blush, I am really loving the corals this year.. I personally love the texture and the colour payoff it gives and I know this will become a regular staple in my makeup routine . but then I opened it up and swatched it and I fell in love .. The colour and the simmer are so very pretty and I can't wait to rock this out soon! 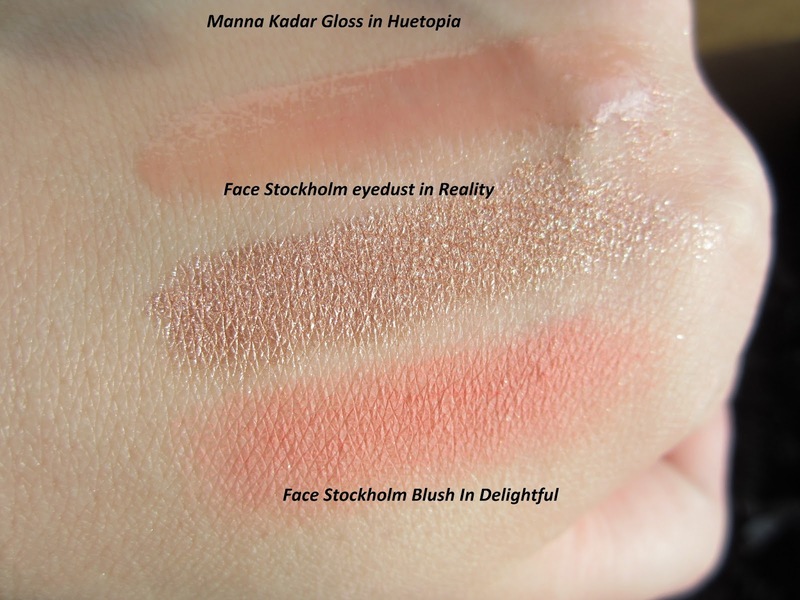 Here are some swatches of the products .. I haven't made up my mind yet If I will stay subbed or not I might use this as a treat subscription now and again. They also offer a monthly Jewelry Box so feel free to check them out if you are interested.. If you do decide to try they offer a skip a month feature so that's handy ..
and if you could use my referral link that would be grand!!! Thank's for reading and until next time !! Thanks Mir!!! I really love it too!!! that's great that they are sending you a replacement. i went with the Jewelry box and found that a pair of my earrings (hoops) were a defect... one was obviously not the same shape as the other. i am thinking of emailing them now about it! i have been dying to try Rainbow Honey nail polishes. they all look so gorgeous! I think you should email them , They have an amazing customer service team ...I am so thrilled with the level of service they provide and I am sure they will send you a replacement . I know I am so happy that I got that in my box I really wanted to try Rainbow Honey too! I may end up buying more hehehe.